"The Original Coffin of Louis Riel"
On the 16th of November,1885, Louis Riel, the founder of Manitoba and leader of the Metis people was hanged for treason in Regina, Saskatchewan. After the execution, his body was put into this coffin and was originally slated to be buried in the gallows enclosure in Regina, but an order from the Lieutenant-Governor changed that plan. Instead his body was sent home to his mother's home in St. Vital, where he was put into a more elaborate coffin and after a time of lying in state, was buried in the churchyard of the St. Boniface Cathedral. The original coffin was kept by his family and for years held his personal belongings, and papers. Some years later, the family donated it to the St. Boniface cathedral where it remained until a fire destroyed the cathedral. Miraculously, the coffin survived but was damaged, losing most of the lower half of the coffin to the fire. 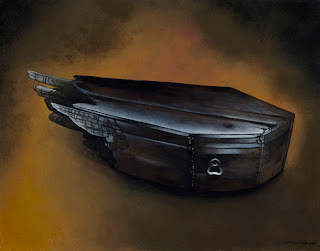 Today the coffin resides in the St. Boniface Museum.